Upper neck ligament high-signal changes on magnetic resonance imaging (MRI) have been found in patients with whiplash-associated disorders (WAD) but also in non-injured controls. The clinical relevance of such changes is controversial. Their prognostic role has never been evaluated. The purpose of this study was to examine if alar and transverse ligament high-signal changes on MRI immediately following the car accident are related to outcome after 12 months for patients with acute WAD grades 1-2. Within 13 days after a car accident, 114 consecutive acute WAD1-2 patients without prior neck injury or prior neck problems underwent upper neck high-resolution proton-weighted MRI. High-signal changes of the alar and transverse ligaments were graded 0-3. A questionnaire including the impact of event scale for measuring posttraumatic stress response and questions on patients' expectations of recovery provided clinical data at injury. At 12 months follow-up, 111 (97.4%) patients completed the Neck Disability Index (NDI) and an 11-point numeric rating scale (NRS-11) on last week neck pain intensity. Factors potentially related to these outcomes were assessed using multiple logistic regression analyses. Among the 111 responders (median age 29.8 years; 63 women), 38 (34.2%) had grades 2-3 alar ligament changes and 25 (22.5%) had grades 2-3 transverse ligament changes at injury. At 12 months follow-up, 49 (44.1%) reported disability (NDI > 8) and 23 (20.7%) neck pain (NRS-11 > 4). Grades 2-3 ligament changes in the acute phase were not related to disability or neck pain at 12 months. More severe posttraumatic stress response increased the odds for disability (odds ratio 1.46 per 10 points on the impact of event scale, p = 0.007) and so did low expectations of recovery (odds ratio 4.66, p = 0.005). High-signal changes of the alar and transverse ligaments close after injury did not affect outcome for acute WAD1-2 patients without previous neck problems. High-resolution upper neck MRI has limited value for the initial examination and follow-up of such patients. The alar and transverse ligaments are important stabilizers at the craniovertebral junction [1–5] and can be injured during neck trauma [6–10]. These ligaments can be visualised on magnetic resonance imaging (MRI) [11–16]. High-signal changes of the alar and transverse ligaments on high-resolution MRI have been reported to be more frequent in chronic whiplash-associated disorders (WAD) compared to non-injured controls . In the same study sample, such ligament changes were related to neck disability and trauma factors like impact direction and head position at the instant of collision [17–19]. These results have not been confirmed by others, and high-signal changes of upper neck ligaments are reported to be frequent also in asymptomatic and symptomatic non-injured controls [14, 20–22]. Such changes thus have unclear cause and clinical relevance. They might be traumatic in some cases but might also represent pre-traumatic morphologic variants with loose connective tissue or fat interspersed between fibres [21–23]. If such variants affect ligament strength and prognosis after neck trauma these MRI findings could represent a target for interventions to improve patients' recovery. The prognostic factors for developing chronic WAD after whiplash injury have not been established. Female gender, more severe post traumatic stress response, and reduced expectations of recovery have been found associated with poor outcome in WAD [24–28]. In recent reviews, high score of initial pain has been pointed out as the most important predictor for delayed recovery [29, 30]. In prior MRI studies on WAD, traumatic findings in the acute phase of whiplash injury were rare [31–35] and did not affect recovery [31, 32, 35, 36]. However, due to the magnetic field strength and MRI protocols chosen, the alar and transverse ligaments could not be assessed. Data on the prognostic role of MRI high-signal changes of these ligaments in acute WAD have been requested . This prospective follow-up study included patients with acute WAD grade 1 or 2 as defined by the Quebec Task Force , that is acute neck complaints after whiplash trauma but no fractures, dislocations or neurological signs. All patients were examined with a dedicated high-resolution upper neck MRI protocol. The aim was to evaluate if high-signal changes of the alar and transverse ligaments in the acute phase of whiplash injury are related to outcome after 12 months. From May 2007 until March 2009 114 acute WAD1-2 patients were recruited consecutively from a primary ward (Bergen Accident and Emergency Department) (n = 76) and a hospital clinic (Haukeland University Hospital) (n = 38). All patients underwent MRI of their upper neck ligaments. MRI findings in relation to clinical characteristics in the acute phase of injury of this inception cohort are reported elsewhere . To be included, patients should be Norwegian-speaking drivers or passengers, aged 18-80 years, sustaining a car accident during the last 7 days, reporting onset of neck pain within 48 hours after the accident, and without any neurological signs or clinical or radiological signs of neck fracture or dislocation. First author ascertained the WAD grading by interviewing the patients and reviewing reports from clinicians and radiologists. The exclusion criteria were prior neck injury or whiplash trauma, prior neck problems (i.e. prior neck pain of more than 30 days in total or reported treatment for neck problems during the last 10 years), prior severe head injury, previous cervical spine surgery, rheumatic disease, cancer or any other serious somatic or psychiatric conditions, and pregnancy. All participants were asked to complete a follow-up questionnaire 12 months after the accident. Three did not respond despite reminders and were excluded from the study, 111 (97.4%) responded and form the current study sample. The Regional Committee for Medical Research Ethics, Western Norway Health Region approved this study. Written informed consent was obtained from all study participants. Within 0 - 13 (median 4) days after their accident all patients filled in a questionnaire containing items regarding potential risk factors for developing chronic disability or pain in acute WAD1-2. It included an 11-point numeric rating scale (NRS-11) of average neck pain since injury (initial neck pain); 0 = no pain and 10 = worst possible pain [39, 40], a pain drawing for the localization of maximum neck pain , and questions regarding accident-related factors and education. Patients' subjective reports of concomitant head injury were registered. Post traumatic stress response was evaluated by the impact of event scale (IES, theoretic range 0-75) , which has been validated in WAD [26, 28, 43]. The result was dichotomized into IES ≥ 26 and IES < 26 [28, 43]. The mean value of completed questions replaced any missing items when calculating the total IES score. Patients also answered to what extent (little, some, great) they expected to get rid of their pain after the accident. These expectations of recovery were dichotomized into high (great extent) and low (little/some extent). MRI was performed within 0 - 13 (median 5) days after the car accident (within 7 days in 96 patients, 86.5%) in a 1.5 Tesla scanner (Symphony Mastroclass, Siemens Medical System, Erlangen, Germany), using a standard one-channel receive-only head coil. Patients' head and neck were in a neutral position. To visualise the alar and transverse ligaments with high spatial resolution while maintaining adequate imaging contrast and signal to noise ratio, a pre-existing MRI protocol was used [23, 44]. It included proton-density-weighted fast spin echo (FSE) sequences in three orthogonal planes, axial, coronal and sagittal: repetition time (TR)/echo time (TE) 2150-2660/15 ms, slice thickness 1.5 mm, interslice gap 0.0 mm or 0.3 mm (sagittal), field of view (FOV) 175 mm × 200 mm or 200 mm × 200 mm (coronal), voxel size 0.6-0.7 × 0.4 × 1.5 mm3 and echo train length (ETL) 13. Two sagittal STIR sequences followed but these were not used in the present study. The summarized acquisition time for the 5 sequences was 31 min 5 s.
The alar and transverse ligaments were graded 0-3 on the proton sequences based on the ratio between any high-signal part and the total cross-sectional area of the ligament as judged visually [17, 23, 45]. No high signal was graded 0, high signal in 1/3 or less of the total cross section was graded 1, high signal in 1/3 to 2/3 of the total cross section was graded 2, and high signal in 2/3 or more of the total cross section was graded 3. The right and left sides were graded separately. The image with the largest cross-sectional area of high signal was used for grading, alar ligaments on sagittal sections and transverse ligaments on sagittal or coronal sections. Any high signal had to be seen in at least two imaging planes to be graded 1-3; otherwise it was graded 0 (no high signal). Homogenous grey ligaments were graded 2. Two radiologists (6 and 26 years experience) who were blinded to clinical data independently graded all proton images, which were de-identified and presented in a random order interspersed between images of non-injured individuals. Both radiologists thereafter solved all disagreements by consensus reading of images. Their consensus grading was used in the analysis, where grades 2 and 3 were combined into one category. Disagreement on the presence of grades 2-3 changes per patient concerned 13 (11.7%) patients for the alar ligaments and 19 (17.1%) patients for the transverse ligament. Kappa for interobserver agreement on presence of grades 2-3 changes was 0.73 for the alar ligaments and 0.52 for the transverse ligament. Uninformed of their MRI results, patients filled in the follow-up questionnaire 51-56 (median 52) weeks after the accident. Primary outcome was neck disability as measured by a modified version of the Neck Disability Index (NDI) [46–48]. NDI should be calculated only when at least 8 of 10 items are answered and was given as a percentage of the highest achievable score . According to previously validated cut off values, NDI was dichotomized into NDI ≤ 8% or NDI > 8% [48–50]. Neck pain during the preceding week was registered on an NRS-11 and categorized into NRS-11 0-4 or NRS-11 5-10 [32, 39]. All 111 patients returned valid data for both NDI and neck pain. Fisher's exact test was used to compare proportions between groups. To compare means the Mann-Whitney U test was used as normality could not be assumed. Multiple logistic regression analyses (stepwise backward, using likelihood-ratio tests) were performed with respectively NDI and neck pain NRS-11 as binary outcome variables. In these regression analyses mutual adjustments were done for age and gender and for all factors potentially related to outcome with p < 0.2 in the crude analysis. Interaction between variables significantly related to outcome was looked for. SPSS 16.0 was used to analyze data. P ≤ 0.05 indicated statistical significance. According to sample size calculations (significance level 5%, power 80%), assuming that one third of the acute WAD1-2 patients would show ligament high-signal changes, a total of 100 responders at 12 months follow-up would be needed to detect a difference in proportions recovered from 60% in those without ligament changes to 30% in those with ligament changes as statistically significant. Median age of the 111 patients was 29.8 years, and 63 patients (56.8%) were women (Table 1). Fifty patients (45.0%) had initial neck pain NRS-11 > 4, and 36 patients (32.4%) had IES score ≥ 26. MRI in the acute phase of injury showed grades 2-3 alar ligament changes in 38 (34.2%) of the 111 patients and grades 2-3 transverse ligament changes in 25 (22.5%) (Figure 1). MRI = magnetic resonance imaging; WAD = whiplash-associated disorders; NRS-11 = 11-point numeric rating scale. *Difference between vehicle speeds if rear end collision, otherwise sum of vehicle speeds. † Highest assigned grade if different between right and left side. MRI of alar and transverse ligaments. High-resolution proton-weighted MRI sections of upper neck alar and transverse ligaments. 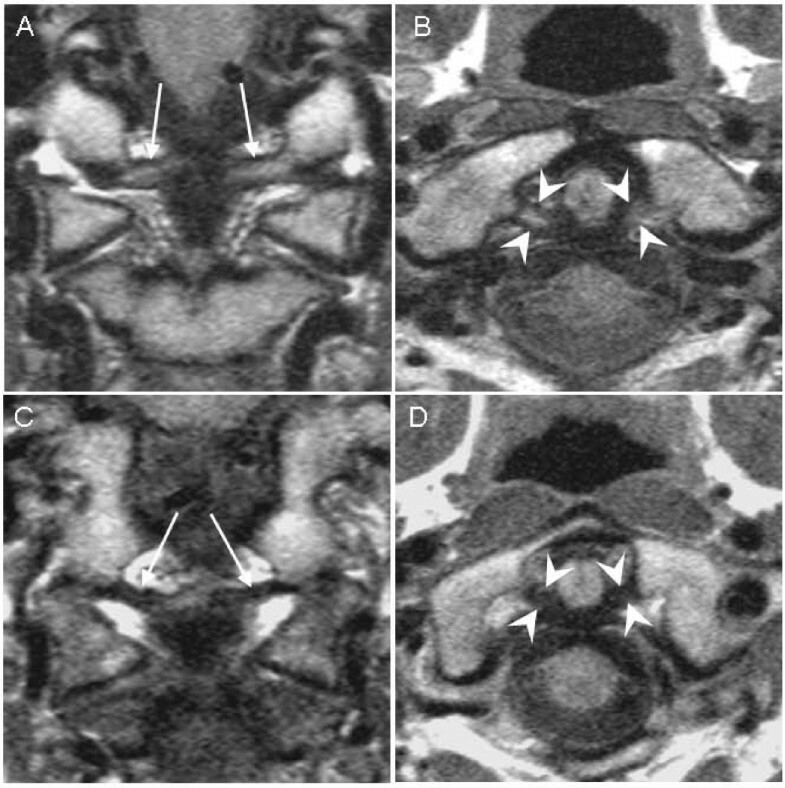 Grade 3 alar ligament high-signal changes (arrows) on coronal section (A) and grade 2 transverse ligament high-signal changes (arrowheads) on axial section (B) in two patients recovered (NDI ≤ 8%) at follow-up. Grade 0 alar ligaments (arrows) on coronal section (C) and grade 0 transverse ligament (arrowheads) on axial section (D) in two different patients reporting disability (NDI > 8%) at follow-up for comparison. At 12 months follow-up, 49 (44.1%) patients had NDI > 8% and 23 (20.7%) had neck pain NRS-11 > 4. In unadjusted analyses (Table 2), these outcomes were not significantly related to MRI grades 2-3 changes of alar (p = 0.14-0.23) or transverse ligaments (p = 0.49-0.59) in the acute phase. WAD = whiplash-associated disorders; NDI = neck disability index; NRS-11 = 11-point numeric rating scale; IES = impact of event scale; MRI = magnetic resonance imaging. * P values are based the difference in outcome proportions between the categories as calculated by the Fisher's exact test. The risk of disability (NDI > 8%) increased with initial neck pain NRS-11 > 4 (p = 0.034), post traumatic stress response IES score ≥ 26 (p = 0.015), and low expectations of recovery (p = 0.001). Also when treating continuous explanatory variables uncategorized, the risk of disability increased with initial neck pain NRS-11 scores (p = 0.011) and IES scores (p = 0.002). Risk factors for neck pain (NRS-11 > 4) were the same as for disability but in addition included female gender (p = 0.032) (Table 2). No other clinical or accident-related characteristic given in table 1 was related to disability or neck pain at follow-up with p < 0.2. In the adjusted logistic regression analysis (Table 3) higher IES scores (odds ratio (OR) per 10 IES points 1.46) and low expectations of recovery (OR 4.66) in the acute phase of injury were related to NDI > 8% at 12 months. No interaction between these two explanatory variables was found. Female gender (OR 3.25), higher IES scores (OR per 10 IES points 1.93), and low expectations of recovery (OR 21.56) were related to neck pain NRS-11 > 4 (Table 3). In this model an interaction between expectations of recovery and posttraumatic stress was found. Post traumatic stress increased the risk of neck pain NRS-11 > 4 for patients with high expectations of recovery (OR 1.93 per 10 IES points) but not for patients with low expectations (OR 1.93 × 0.51 = 0.98 per 10 IES points). NDI = neck disability index; WAD = whiplash-associated disorders; NRS-11 = 11-point numeric rating scale; OR = odds ratio; CI = confidence interval; IES = impact of event scale; MRI = magnetic resonance imaging. * P values are based on likelihood-ratio test. † Not in the final model, p-value for adding term to final model. ‡ Highest assigned grade if different between right and left side. When included into these logistic regression models, MRI grades 2-3 ligament changes in the acute phase of injury were not related to NDI > 8% (alar: p = 0.76, transverse: p = 0.76) or neck pain NRS-11 > 4 (alar: p = 0.51, Table 3; transverse: p = 0.42) at follow-up. In this first study on the prognostic value of upper neck ligament MRI findings, high-signal changes of the alar and transverse ligaments at injury were not related to outcome 12 months after whiplash injury. This result was highly robust and remained after adjustments for factors that may influence outcome. We hardly missed relevant high-signal changes, since every patient underwent dedicated MRI within 13 days (86.5% within 7 days) after the accident. The ligament grading had adequate reliability, was performed blinded to outcomes, and was not conveyed to the patients or their health care providers, since information per se on MRI results can affect prognosis . The finding that ligament high-signal changes in acute WAD1-2 were not related to outcome has important implications. First, due to this lack of prognostic value, such changes are unlikely to represent a target for treatment, regardless of whether they are traumatic or represent morphologic ligament variants. Second, routine use of high-resolution upper neck MRI is not warranted in acute WAD1-2. Third, the high-signal changes are less likely to be injury-induced. Although structural damage from an injury may heal without causing long-term complaints, at least some prognostic effect of alar and transverse ligament high-signal changes would be expected if they were due to the acute, mechanic incident. The ligament changes more likely reflect normal variants, also because they were not related to trauma factors and were equally frequent in non-injured controls, as reported elsewhere . Imaging artefacts or age dependent degeneration can not explain such high-signal changes . Further data on the underlying morphology could provide insight into MRI evaluation of ligaments, but are unlikely to aid clinical decisions in acute WAD1-2. The present study showed that female gender, more severe post traumatic stress response, and reduced expectations of recovery are associated with poor outcome in WAD, in line with previous reports [24–28]. An independent effect of degree of initial pain [24, 29, 30, 43] was not confirmed, probably because pain just after the accident may be intense but temporary. Impact direction, head turned at impact or speed at impact did not affect outcomes, similar to previous findings on collision factors [24, 29, 30]. In this prospective study of unselected WAD1-2 patients without previous neck problems we found better outcomes than in two previous studies; one Australian study  reporting NDI > 8% in 60% at 24 months and one Danish study  reporting NRS-11 score > 4 in 44% at 12 months. This may be explained by their inclusion of patients at higher risk due to neurological signs  (WAD3) or more severe initial symptoms . Patients with previous neck problems probably have poorer prognosis [29, 52, 53], and the prognosis after isolated whiplash trauma would best be ascertained in cohorts excluding such patients. However, due to recall bias we can not be sure that all our included WAD1-2 patients actually had no prior neck problems. A major strength of our study is the prospective design and the high proportion of responders at follow-up (97%, 111/114) which prevented selection bias. Our sample of patients both from a primary ward and a hospital clinic should be representative of WAD1-2 patients reporting no previous neck problems who seek medical care shortly after a car accident. The numbers included should be adequate to detect clinical relevant differences in proportions recovered between patients with and without ligament high-signal changes. We had insufficient data to discriminate between WAD1 and WAD2. However, the effect of WAD grades on outcome is controversial [53–55]. Neither did we include data on anxiety, depression or cervical range of movement [43, 56]. We had to limit and prioritize between possible risk factors according to sample size and distribution of outcome variables. Potential residual confounders could not have changed our results for prognostic value of MRI high-signal ligament changes unless they were unequally distributed between patients with and without such changes. In contrast to previous examinations of acute WAD1-2 patients, our MRI protocol was intended to visualise craniovertebral ligaments. We focused only on the alar and transverse ligaments. Investigating the mid or lower neck ligaments or other anatomical structures at the cervical spine was beyond the scope of this study. Previous studies have focused on fracture or dislocation, traumatic disc or endplate changes, soft tissue bleeding/edema, posterior or anterior longitudinal ligament rupture and spinal cord injuries [31–36]. As no relation to prognosis was found, cervical spine MRI has not been recommended as a standard procedure in these patients [31–33]. Our results show that adding MRI sequences capable of visualising craniovertebral ligaments does not change these recommendations in acute WAD1-2. Acute ligament injuries not visible on our MRI sequences might through a subsequent repair process of fibrosis and scarring cause high-signal changes at a later stage of whiplash injury. Results from case-controlled studies on ligament changes in chronic WAD are contradictory [17, 21, 22]. No relation between ligament changes and time since injury (40 days to 59 years, median 5 years) was found in clinically referred WAD1-2 patients . However, acute WAD cohorts should be studied with MRI follow-up examinations to find out how ligament structure may alter over time. Such studies could help establishing if high-resolution upper neck MRI adds valuable information at a later stage of whiplash injury. In this study of acute WAD1-2 patients without previous neck problems, MRI high-signal changes of the alar and transverse ligaments in the acute phase were not related to disability or neck pain 12 months after injury. Female gender, more severe post traumatic stress response, and low expectations of recovery were associated with poor outcome at 12 months. Upper neck MRI is of limited value in the initial examination and follow-up of WAD1-2 patients, and is not recommended for routine use. This study received funding from Grieg Foundation and the Norwegian ExtraFoundation for Health and Rehabilitation. All authors collaborated in designing the study. NV and JK performed the image interpretation. NV collected and coded all data. GEE, NV and AE performed the statistical analyses. All authors contributed in writing the manuscript and read and approved the final version.